I came to the 200th episode of Supernatural from a week-long hiatus in which I had written for five straight days, or approximately 120 hours. What was I writing? Fan fiction. The 200th episode has been described as a “love letter to fans” so, without further ado, allow me to meta some meta. Dean’s jonesing for a case. He seemingly pulls one out of thin air and convinces Sam to help him investigate the disappearance of a drama teacher at an all-girls high school. 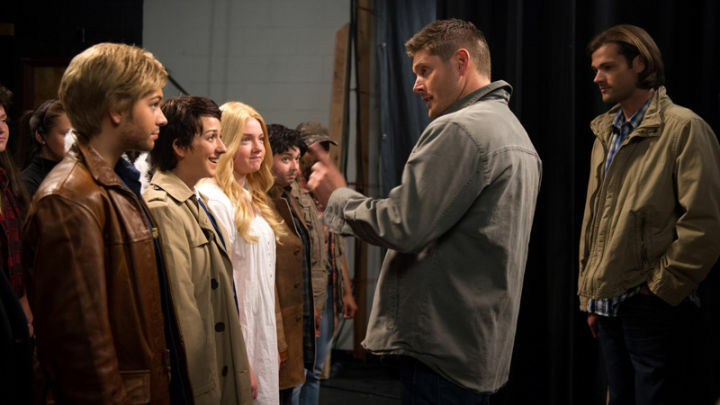 The school is putting on a play: Supernatural the Musical, a “transformative work” penned by a high school girl as an homage to Carver Edlund’s works. 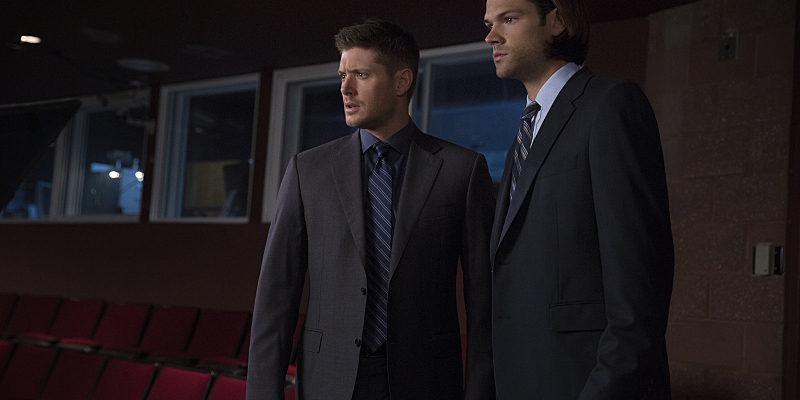 Sam and Dean are not thrilled. Turns out the goddess of epic poetry, Calliope, has a taste for the supernatural and wants to devour the writer of the play. 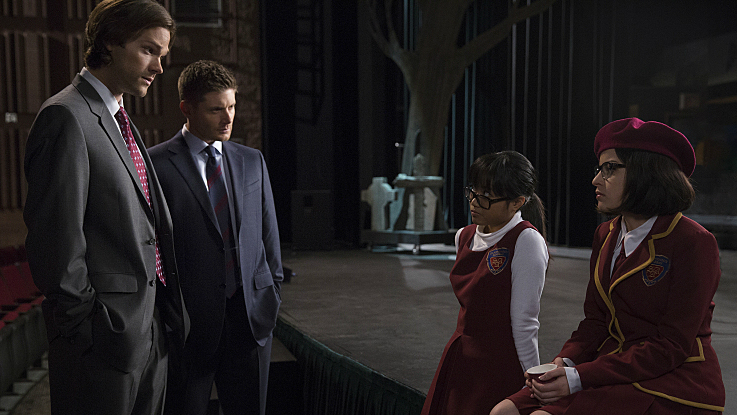 So the show must go on, and Sam and Dean must kill a goddess to protect the girls. In the episode “Metafiction”, Metatron asked us, who gives the text meaning? In “Fan Fiction”, the writers ask us whose version of the text is correct? Theirs? Ours? The drama teacher asks, just before she is taken by the Scarecrow, “Where is the truth in supernatural?” It is a fair assessment that the authors, the creators of the show, are asking us, the audience, what draws us to the show. If it were purely for entertainment value, would it have lasted so long? 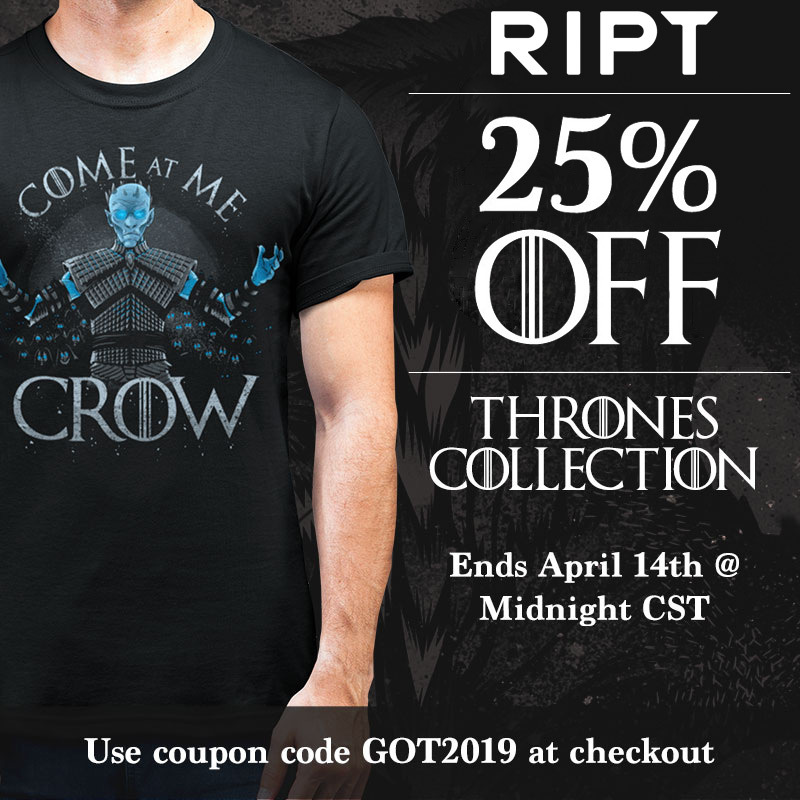 I am entertained by Game of Thrones, but that would not move me to fly halfway across the world to attend a GRRM convention, the way I currently am en route from London to Los Angeles for Burcon. Do we watch because it’s scary? Supernatural hasn’t been scary in seasons, its MotW episodes merely a fodder of excuses for a welcome break from dickwad angels and prissy demons. Do we watch Supernatural because it is something we’ve never seen before? No, most of its current plots are recycled from earlier seasons. Where is the truth, then? In the final scenes of “Fan Fiction,” the brothers have their BM moment—both in the transformative work of drama and in the canonical sense that we’ve come to know over the past ten seasons. Sam and Dean, the real, watch their fictional-within-fiction counterparts drive Baby, just the two of them against the world. After season 9, we all wanted a #betterbrobond. Well, it looks like we might finally be getting one, now that the Winchesters have realized what we, the fans, have known for ten seasons: Supernatural is about family. Blood or not, it don’t matter, as long as you have each other’s backs. Robbie Thompson is my favorite . Hands down. 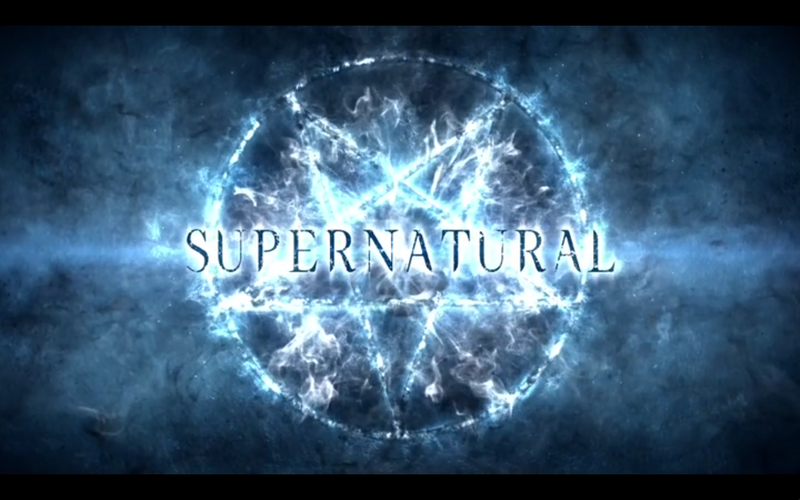 He gave me “First Born.” He gave me “Meta Fiction.” He’s given me “Fan fiction.” Now, as much as many people hate the meta episodes, the meta episodes are what, stylistically, set Supernatural apart from every other show on television. The show is unafraid to acknowledge what many creators spend their time actively ignoring: fandom. Fandom is a finicky thing. I love the community, the creativity, the passion, but where there are strong opinions, there are strong differences of opinion as well. There are times when we are shamed, bullied, harassed, misunderstood. TV Guide recently published an article on the show’s tendency to queerbait Destiel, and it has encouraged impassioned responses from every angle of the debate. Fandom is not a safe harbour, nor it is it a silent one. Robbie Thompson acknowledges the contentious fan culture in the 200th episode by allowing debates over Marie’s transformative interpretation of Carver Edlund’s work, and the literal disappearance of those who disagreed or threatened her authorial vision. While not every meta episode of Supernatural says what we want it to, I think that the acknowledgement is the first step in a potentially transforming multimedia creative environment. We are not passive, silent viewers who watch a television show, read a book, or watch a film and have an audience of our immediate family and friends to share our opinions on it. Twitter, Tumblr, blogs like this one have changed the game. The divide is lessening; the creators are connecting with the audience, and instead of an artistic vision that is devoid of audience input, we can now actively engage in online discussions and tell the writers what we want to see. This is not to say, however, that the writers will or should give us what we want. The intellectual property of the creative writer is still their own to do with as they please. Rather, the power of the audience lies in the ratings. A smart television writer knows their audience, and knows what they want to see. Twitter, Tumblr, and lengthy meta recaps like this one simply give us the voice to let the creators know what we want. If, as Barthes suggests, the traditional author is indeed dead, then, perhaps, so is the traditional reader, but now the reader may be reborn into the meta writer, the proponent of transformative works, the engager of fan culture. I was expecting the show to acknowledge the fandom, pat us on the head and say, “Oh, it’s cute that you love us so much to write fan fiction.” Yet at the end of the 200th, I found myself feeling really hopeful for the SPN fandom for the first time in a really, really long time. Why? Not because Dean finally came around to the idea of “subtext” or because the Winchesters begrudgingly agreed that Marie was entitled to her own version of the story. No, it is because Thompson wrote Marie’s fan fiction with the same love that I write my own. She grasped the heart of Supernatural and even if there were ninjas and tentacles or whatever, it worked because she understood the characters in a way that sometimes even the show’s writers do not (*cough cough* “Rock and a Hard Place” *cough cough*). The “love letter to the fans” was successful, not just because it acknowledged us, but because it respected us. Chuck’s response to Marie may initially sound dismissive, but think on this: three of the largest religions in the world—Judaism, Islam, and Christianity—are rooted from the same history, which later divided and had separate prophets and became separate interpretations. I am not suggesting that Supernatural will one day be worshipped by billions across the globe, but rather that if religion can transform itself into distinctly different versions of the same origin, why can’t a television show? The arrival of Chuck could be a one-off hearkening back to a time when Supernatural knew the definitive limits of the apocalypse, or it could be the turning of a page, a chance for the show take its origins and breaking away to something new. In essence, Supernatural could now become a transformative work of itself, and the “love letter to fans” would become canon and fanon.